Pac-Man, shown here in its championship version, was the biggest arcade-game craze of the early 1980s. (CNN) -- A rotund, voracious figure follows a trail through a maze. As he rounds a corner, he is confronted by ghostlike monsters attempting to wipe him out. He turns and flees, but soon discovers an additional source of power that briefly turns him from hunted into hunter. This simple premise gave birth to Pac-Man, the most successful coin-operated video game in history. Many credit Pac-Man, an iconic symbol of the '80s, with expanding video gaming to a wider audience. "Pac-Man's debut represents one of the earliest attempts to introduce casual gaming to a field that was already dominated by shooters and high-energy arcade experiences," said Scott Steinberg, head of video game consulting firm TechSavvy Global. "The original arcade cabinet was able to strike the perfect balance between challenge and fun without sacrificing depth or scope." The original arcade classic was imagined by Namco developer Toru Iwatani in 1979, although it didn't reach the U.S until the fall of 1980. As the legend goes, Iwatani was inspired by his partially eaten pizza pie and turned it into a gaming character: a big yellow dot that gobbled up smaller dots, and avoided four deadly ghosts, as it careened through a maze. "During the early stages of the arcade industry, where most games skewed towards a male audience, we saw the need to expand our appeal," explained Kenji Hisatsune, president and CEO of Namco Bandai. "In order to fill this void, Pac-Man was created as a 'cute' game with both good and bad characters that were colorful and endearing." "The original Japanese name was Puckman, which evolved from the Japanese word paku, meaning 'chomp,' " Hisatsune said. "Given the closeness to a certain explicit four-letter word, a lot of arcade operators were worried that vandals would alter the letter P. Eventually, 'Pac' was suggested as an alternate name." Developers also created the four colorful ghosts, Pinky, Blinky, Inky and Clyde, with distinct personalities. For example, Blinky likes to chase while Pinky lurks in ambush. It was a novel concept in gaming that wasn't being developed at that time. Its light-hearted originality and simplicity -- players needed only to move a joystick -- made it an immediate hit. Some speculated that Pac-Man became popular in bars in part because gamers needed only one hand to play and could hold a drink in the other. In the first 15 months after its release in the U.S., Namco sold more than 100,000 arcade units, while fans spent more than $1 billion in quarters to fuel what would become known as "Pac-Man fever." Lisa Sharp, a 36-year-old finance director at Georgia Tech University, remembers cashing her $10 weekly allowance into quarters to play Pac-Man for as long as the coins lasted. Her first taste of the game came from an unlikely place: her dentist's office. "I hated going to the dentist, but he had Pac-Man and Centipede in his office where you could play for free," Sharp said. "It was the only thing that calmed me down, and I loved it." As a child, Sharp would sneak away to her corner 7-Eleven with her pockets full of coins to pump into the arcade machine. She wasn't a gaming geek at the time, but Pac-Man gave her a sense of accomplishment. "You keep going [throughout the levels of the game]. It gets harder, but it was a feeling of progress," she explained. "Plus, as a kid, I didn't want to get eaten by a ghost." Pac-Man's appeal to kids was reinforced by a Saturday-morning animated TV series and a breakfast cereal with marshmallow ghosts. In all, Pac-Man has been licensed to more than 250 companies for products ranging from air fresheners to bed sheets to costumes. An unlicensed sequel, Ms. Pac-Man, followed in 1981. Namco soon embraced the game and adopted it as an official title. 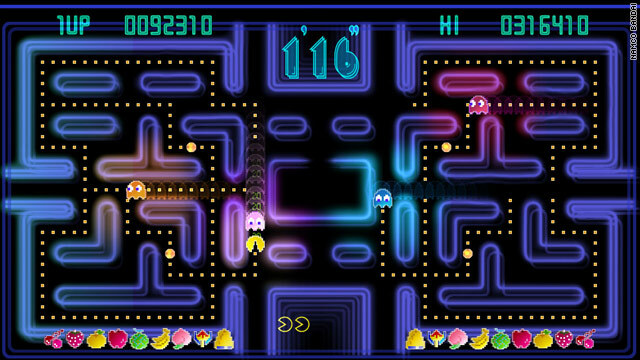 In all, more than 30 official spin-offs, plus numerous clones, were inspired by Pac-Man's success. "Pac-Man Fever," a novelty song by Jerry Buckner and Gary Garcia, reached No. 9 on the Billboard pop chart in early 1982. Sharp said she tried sequels such as Ms. Pac-Man but always preferred the original game. "I would play every chance I got," she said, although the game disappeared from many arcades by the 1990s. "It became harder to find Pac-Man [as I got older]." Although the game is far removed from its 1980s heyday, Pac-Man's appeal continues to endure. In 1999, Billy Mitchell of Florida became the first player to achieve a perfect Pac-Man score -- 3,333,360. And versions of the game remain popular on the iPhone and iPod Touch. Namco's Hisatsune believes Pac-Man's combination of cute characters and cat-and-mouse gameplay are at the core of its popularity. He also thinks Pac-Man's biggest legacy will be its pioneering status as the first game to appeal broadly to men and women. Some even attribute today's wide variety of video games to Pac-Man's acceptance in the culture. "I don't think that it's an understatement to say that today we would have no Mario, Master Chief or Lara Croft if it wasn't for the pioneering efforts of the grinning, little, yellow dot-gobbler," said Steinberg of TechSavvy Global. "It remains as engaging, fresh and relevant as the day it first shipped." Hisatsune has a message for today's game designers. "Pac-Man has taught game makers to not be afraid, to take risks and strive to create games that bring the world closer together," he said.